Large, recently updated 3 bedroom, 2 bath, 1520-sq ft, lakefront condominium with a breathtaking view of the Lake. This is one of the few condo's at Lands End that has top floor views along with walk-in access from the parking lot. It is located in Building 5, which is one of the newest buildings at Lands End, and is also next to the outdoor pool. The condo has been professionally decorated and fully updated. The living room features a new 50” LCD TV, home theater system, Wi-Fi, recling couch, two reclining leather chairs, and a loveseat. The Kitchen is fully furnished with stainless steel appliances, needed staples, and a large dining table/breakfast bar that will accommodate eight people. The private deck includes a new six person patio set, gas grill, and fantastic views of both the main channel and the no-wake zone channel leading to the Grand Glaze bridge and State Park. The State Park is an excellent place to water ski if you have a boat. The master suite has a fantastic view of the lake, as well as a sliding glass door to give easy access to the large deck. Features include a king bed with pillow top mattress a 42” HD TV, cable access and Blu Ray DVD. There is a private bath off the master bedroom with double sinks, a shower and a jacuzzi tub. There is also a separate walk-in closet filled with extras to help make your stay enjoyable. The second bedroom has a king bed with attached bath, and the third bedroom is equipped with a queen bed. Both of these bedrooms have HD TV's and ceiling fans. A Coleman inflatable air mattress is also available for additional guests. In the living room there is a pullout single sleeper bed. A washer and dryer are included in the condo in a separate utility room. Only a five minute drive away is a 110 store factory outlet mall, golf, miniature golf, go-cart track, as well as a State Park with lots of outdoor amenities. If you brought your boat, we have a 16 x 48 ft boat slip for $20/night additional. 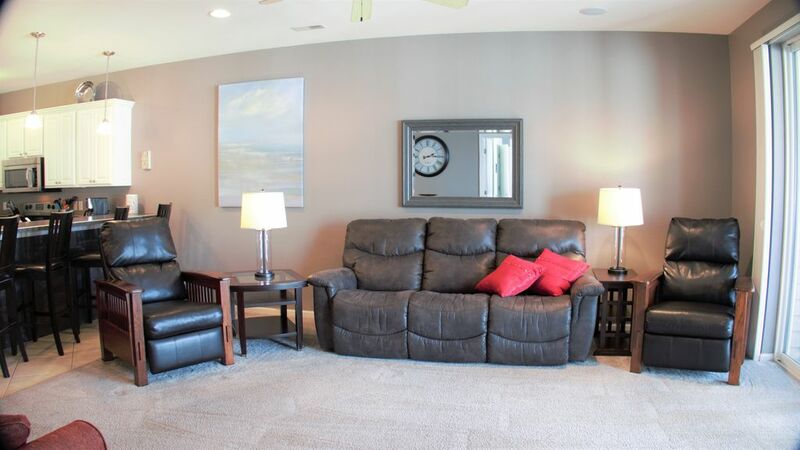 In the heart of Osage Beach, this 15-acre condominium complex has everything you need to have a fantastic vacation. During the mornings relax on your deck and watch an amazing view of the boats on the lake – everything from jet skis to 50’ luxury yachts! During the day enjoy the pool next to your building that features a waterfall & upscale patio furnishings. Our condo is located in building 5, which is the closet condo to the pool in the Lands End Complex. For families there is a separate children’s waterpark w/ lazy river & a large playground & basketball court. The modern clubhouse features a state-of-the art fitness center as well as a pool table and lounge area for guests. In the evenings take a walk on the half mile lighted boardwalk that features a 10 mile panoramic view of the Osage (Main Channel) & Grand Glaize. Then watch the beautiful sunsets from your deck that will take your breath away. There is a separate $100 cleaning fee that should be left in the condo at the end of the stay for the housekeeper. Our family lives in Cedar Rapids, Iowa and has been coming to the Lake of the Ozarks for many years. Land's End is by far the best location we have stayed at. The lake is a fantastic place to come with family and friends, and we hope you decide to enjoy a peaceful time at our home away from home. Very comfortable and cozy accommodations! We had a wonderful time! Great condo/2nd visit & will be back again. This was a great spacious place to just get away with my family. Enjoyed the fireplace and view. Did a little shopping and took our granddaughter to the park. We also loved the workout facility. Lands Inn Condos are our favorite location in Osage Beach to stay. Beautiful condo and complex! Only issue was several little kids in adult pool everyday other than that great stay! Really enjoyed this condo, it is clean and very spacious. Close to the mall and restaurants. The owners are great to work with, have dealt with them several times and have always had quick and easy communication. Walk right to your door from the parking spot, no steps even though it is a top floor unit with fantastic views! You will love everything about your experience if you stay here!! Our stay was awesome! This condo was equipped with everything. We've rented at Land's End numerous times and other local condos, but this has been our best stay yet. Very cozy!